So. It’s not like the “recipes” we’ve been posting here lately have been super gourmet or anything, but when you’re on week 3 sans oven, you just do what you have to do. I’ve been googling whether or not I can grill baked goods (as in bake them on the grill… heck yes I know you can grill pound cake, and that shiz is great). I’m pretty sure I’m going to try it this week, internet (or spousal) discouragement be damned. We have a new rule in our household (by “we,” I naturally mean that my husband created one for me), due in large (or sole) part to the great smoothie dumpage of yesterweek. He announced that glassware would no longer be permitted to leave the house in a car (more specifically, MY car). I understand the intent, but also argued that I could very easily (VERY easily) lose control of liquids in plastic, styrofoam or paper. So instead, now I have to discover vessels that are lidded to tote my various and sundry snacks and eats (THOUGH, somehow while transporting a securely fastened jar of pickled onions to a food bloggers picnic this weekend, there was some serious fluid leakage (EW. I know) across my backseat). It’s not a bad thing, really, it’s just that I get some early parenting practice… on myself… ? Anywho, we wandered into our favorite farmer’s market on a dreary Friday morning to kill some time and pick up weekly produce essentials. DTH knows the farmers there, and we like to support them, grab some greens and squeeze some melons (seriously, those watermelons are phenomenally sweet and juicy. An ideal melon… teehee). We picked up a basket full of strawberries, and I couldn’t wait to add them to my daily food intake. We’ve been enjoying kale smoothies basically every day for 50 days straight, and you know, sometimes you just need some variety. Since I’ve been on a jam and granola making streak (read: obsession), I wanted to incorporate those in a breakfastal (yes, I just made breakfast into an adjective) change of pace. As a native Southerner, one would assume that mason jars would coincide with my life like oxygen, but quite the contrary, really. Until a few months ago when I knew my collection of grains and lentils were out of control, and the half rolled up bags were spilling all over my cabinets. I picked up a flat of the quintessential Ball jars, sorted my grains, stacked them and breathed a sigh of relief. When I realized I had created about 14 pounds of granola and 6 of jam, I reached for the jars again for storage (not a novel concept at all, I understand). And when I decided to send DTH to work with a quickie (well, an edible quickie) in hand, I reached once more for the mason jars. I wanted a departure from the smoothies that would be equally filling, nutritious and delectable (and naturally featured my homemade treats). 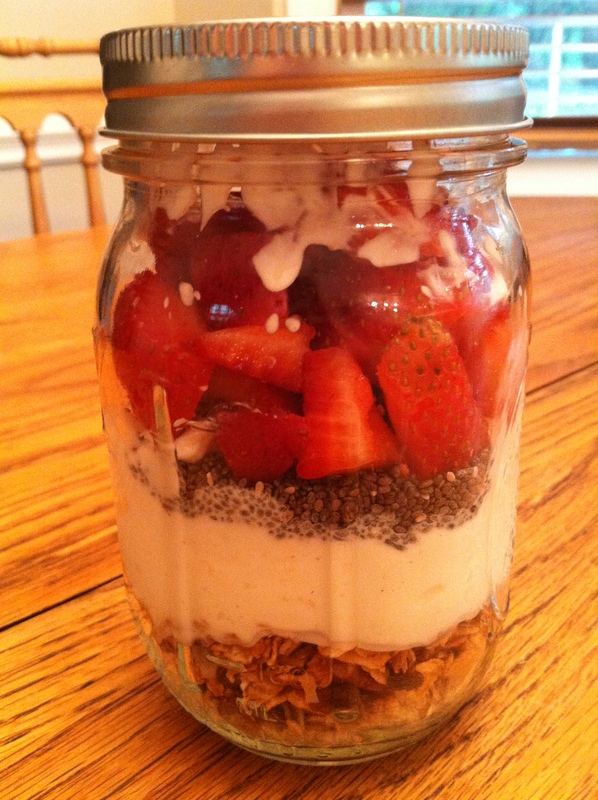 I also wanted to be able to pack it the night before without spoiling the crunch of the granola. I created a parfait layering first the granola, then the yogurt (only the top few centimeters of the granola is exposed to the dairy – our personal favorite being Chobani vanilla Greek… perfect texture and non-cloying sweetness), then some chia seeds, a layer of jam and the the most succulent of my berries (my guy always gets my best fruit, wink wink). I found some taller, skinnier jars too, which allowed for a double layer of each. A clean, tidy, perfectly packed treat indeed.